Toric polycarbonate lens provides excellent optics and increased field of view in chemical splash and debris impact applications. Flexible comfort-cradle suspension cushions the head for all-day wearability. Glove-friendly large control knobs provide easy adjustment. 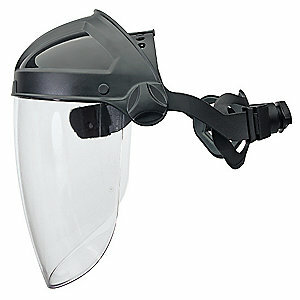 Compatible with other personal protective equipment. Push-button release system makes visor exchange fast and easy.